Named after the character in Mark Twain’s famous novel, the Tom Sawyer ferry features a a choice of cabin accommodation, a casino, a cafeteria and a shop. Onboard cabin accommodation on the Tom Sawyer comes in the form of 2 and 4 berth, inside and sea view (outside). All cabins are en-suite and are located above the car decks. The kitchen crew on the Tom Sawyer take care of your 'gastronomic well-being' with a large choice of food available from the buffet. 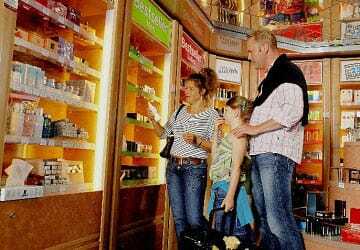 The 'Sea and Save Bordshop' is a shopper's paradise featuring a wide range of cosmetics, tobacco goods and confectionery, fashion and accessories, wine, spirits and beer. You can also relax in the sauna onboard the Tom Sawyer or if you fancy a flutter then try your luck on the slot machines in the 'casino'. 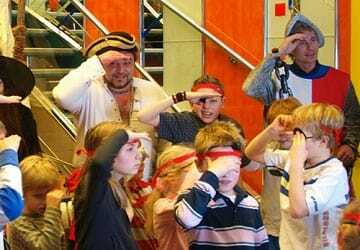 Children are well catered for with TT Line and the Tom Sawyer features onboard entertainment during peak season and a dedicated children’s playroom. 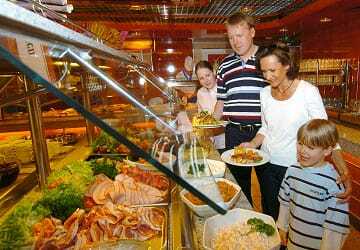 Children up to 6 years old eat for free in the restaurant which also has a children’s menu. Upper decks are directly accessible from the car deck by wide lifts. Specially adapted cabins are also available. Please Note: Whilst we have taken great care in making our Tom Sawyer guide as accurate as possible, onboard facilities, services and entertainment may vary depending on the date and time of year that you travel, facilities mentioned may change without notification and ferry companies reserve the right to operate vessels other than those mentioned at time of booking without prior notification. "Great friendly service, nice clean boat and on-time"
I chose this route because it was the cheapest, and maybe thought that it wouldn't be that great. I was wrong. The boat was quite old but still really clean. Amazingly there was a free sauna and hot showers. We hadn't brought our towels and shampoos but the lovely friendly man in the restaurant unlocked the deck doors and let us go down to the van. There were plenty of plugs all around. The only downside was the coffee in the cafe. It wasn't that great. But overall, great ferry service. Last minute booking for journey variations. Booked with smartphone, easy without problems. Price worthy way to travel to Germany. Worked perfectly! Fresh and clean cabins, a bit worn though. Clean and neat! "Nice trip, but the restaurant......:-("
Most comfortable journey, 100% on time. Lots of available seats both outside and inside. Good tax free shop. Not so good food in the restaurant and the staff were not friendly and had very little English knowledge. (No one there spoke anything else but German, which is not good enough when they are working on a passenger ferry). But, we will sail TT Line next time and we will bring our own food. "Good trip could be better"
Complicated check in and the way from check in to ferry on both sides. Why is there no cash machine? Pleasantly surprised. Everything went smoothly from embarkation to disembarkation. Friendly staff. Beautiful ships. We will certainly travel again. The check-in procedure only took a few minutes. It was very helpful that the office was open the previous evening for us to confirm the arrangements. A bus took us onto the car deck of the ferry from where we continued on foot. Although we were on a day sailing the cabin was laid out for either sitting or sleeping. There is an en suite shower. 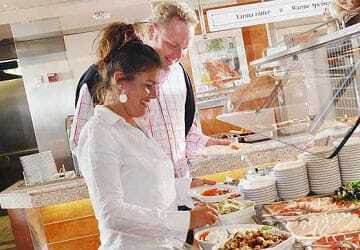 The restaurant was enormous and the buffet food very acceptable for a fixed price. On the upper deck is a sun deck. Being the only foot passengers we had to wait longer than I would have wanted to be allowed to walk through the lorry deck to a waiting bus which took us to the public area at the port for a taxi or onward bus. We thoroughly enjoyed the whole experience and would recommend the journey as a way to travel from Sweden to Germany. There is a B&B close by at Trelleborg and the railway from Malmo should be operational again next year. "Ferry from Trelleborg to Rostock"
We had a nice sailing from Trelleborg to Rostock. It was a nice and warm day, we were out on deck most of the trip. The ship's staff were friendly and very serviceminded. The food was good and there were enough places to sit. The sailing lasted for over 6 hours. Including caravan we paid less than we would have had we traveled with Fjordline or Colorline from Krisiansand to Hirtshals. We will sail this route again. 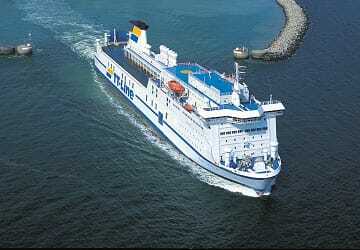 "on time and very friendly"
"Exquisite service, pleasant crossing "
Ferry from Rostock to Sweden. Rapid settlement, pleasant cabin, inexpensive breakfast. The ferry crossing between Trelleborg and Rostock is 6 hours during daytime. It's very long when the only possibility to get a seat is either in a confortable area, but without any external opening or in the cafeteria. There are no seats on the outer decks. The staff doesn't necessarily speak English (forget about French). It's better to book a cabin, even during the day. I got surprised that the ferry went to slowly over the sea, very comfortable. The public areas and the toilets were well cleaned. The offer to rent a cabin to rest was very good, (but we didn’t use it). The only thing I was to change is the prices for the drinks. One bottle of water cost 4.2 euro (40 sek), which made us bring our own water on the way back. We will travel again.